365 French Days: Let them eat cake! The momentous week is over! My littlest has turned ONE and my oldest has turned THIRTEEN! Very exciting -- their birthdays are 3 days (and 12 years!) apart-- and I love it. My oldest has already proven himself as an awesome big brother to 'Middle Garcon' who is eight, and of course is completely crazy for his little sister, 'Petite Fille', who consequently took 7 steps yesterday... actually she would have take a few more steps, but I screamed, so she instantly sat down.....it was exciting! I couldn't contain myself! She is absolutely enjoying the new freedom that being so mobile brings having now two options: speed-crawling and walking.... Oh my. So two cakes were made; one for the little girl and one for my big boy. I have been experimenting with baking so much more since moving to France. I think it's fair to say that the French are on the top of the podium for baking---anything. One of my favorite things is how commonly almond flour or 'meal' is used in baking--in fact you have probably noticed it sneaks it's way into almost every baked good I make. Not only is it gluten-free, but very nutritious; high in protein and low in carbs--not to mention moist and delicious! 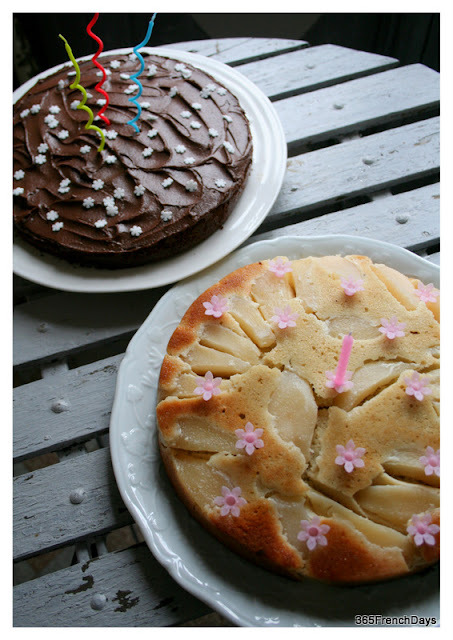 'Petite Fille's' cake was a yummy moist, rustic and simple almond-pear cake. Call me a conservative health-nut--but she is one, and I am totally against artificial flavors, tons of sugar and disgusting neon-frosting for a birthday cake. She is a gorgeous, healthy, funny and sweet baby--and I would like her to stay that way! Pretty, fresh, rustic.....country pear cake! Enjoy!